Photo taken by Tom Ryman, courtesy Joy Elizabeth. Also, I’d been working on a novel for some years, and needed a huge push to get back into writing. And that’s what I got. Work had to be presented for assessment, so I wrote and wrote and honed and honed, and my writing grew and developed. Under the guidance of the lovely Rohan Wilson, we learnt a great deal about shaping our work, and began developing and refining the many skills needed to produce a well-written novel. 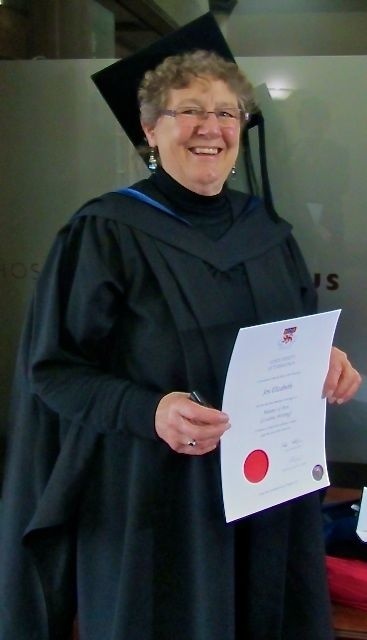 I was very proud to graduate from UTAS in August, 2013, with my MA in Creative Writing. Now the challenge is to continue working, to finish the novel. Luckily, a number of us are already meeting regularly to support each other in doing just that.